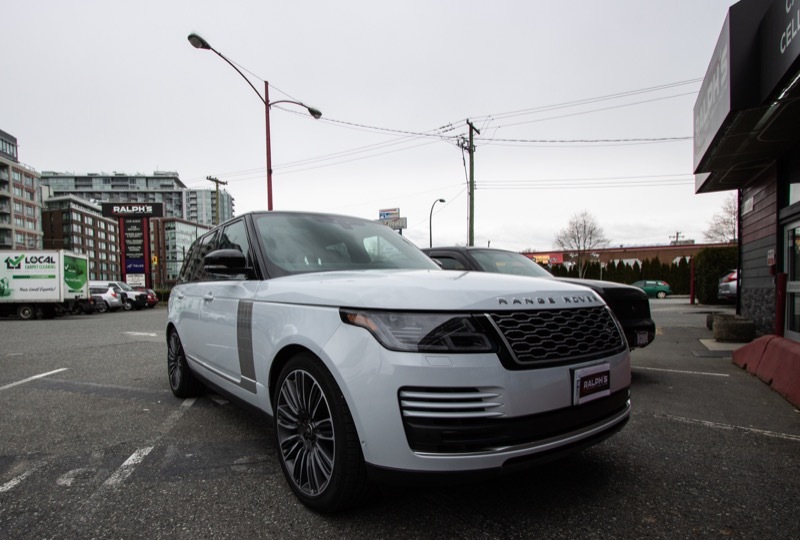 A repeat client from Vancouver recently dropped into Ralph’s Radio to discuss a 2018 Range Rover bass upgrade. We’ve installed several sound systems for this client in the past, making the consultation process efficient. After listening to the vehicle and discussing where the Meridian sound system seemed to be lacking, we developed an upgrade plan that would bring the vehicle up to the client’s standards. Before we start work on any vehicle, no matter the scale of the system or the value of the car or truck, we protect the interior with heavy-duty seat covers and a steering wheel cover. We also use 3M interior and exterior protection tape to make sure there are no scuffs or scratches around the doors, hood or truck while we are working on the vehicle. Our goal is to ensure that everything is in the same or better condition than when you drop the vehicle off with us. Analyzing the interior, we found this spot to be ideal for the subwoofer. We removed part of the carpeted trim to make more room for the enclosure. Our technicians made a multi-faceted enclosure to fit the side of the hatch area. Our enclosure left plenty of useable hatch space. The aluminum grille fabricated by our technicians adds some flare to the enclosure. Even the most elaborate factory entertainment systems seem to lack true audiophile quality bass performance. We understand that automakers need to manage cost and weight when developing a product, but true music enthusiasts know that when it comes to an immersive and realistic listening experience, nothing beats a great subwoofer system. For this Range Rover, our fabrication team created a custom subwoofer enclosure that fits into the recess on the right side of the cargo area. The rear of the enclosure is made from nine pieces of medium-density fibreboard to provide a solid, vibration-free home for a single 10-inch Focal subwoofer. The front panel of the enclosure includes a vinyl finish that blends into the side panel of the vehicle and a mesh grille to protect the face of the subwoofer when cargo is loaded into the vehicle. The Wavtech convertor allowed us to retain the factory headunit as the source for the subwoofer signal. The amplifier was attached to the vehicle on a custom mounting plate. The small size of the D2 amplifier allowed it to fit behind the factory panel. We used a Wavtech Link-D line-output converter to extract a usable audio signal from the factory amplifier and process it to a voltage that is suitable for the new subwoofer amp. The Link-D also creates a remote turn-on output to activate the amp and allow the subwoofer upgrade to function seamlessly. The new subwoofer is powered by a Mosconi Gladen D2 500.1. This compact amplifier can produce up to 475 watts of power from an extremely compact chassis. We mounted it vertically in the Range Rover so it wouldn’t take up any usable space. We used Audison Connection power wire and interconnects to feed signal to the amp and power from the battery. Our technicians are equipped with supplies on par with the automaker’s to protect and secure any wiring we add. In the case of this Range Rover, we used automotive-grade fleece tape to bundle and protect the wiring while preventing buzzes and rattles. This stunning Range Rover now has the bass upgrade it drastically needed. The last step in this Range Rover bass upgrade project was to fine-tune the amplifier and audio interface to work with the factory sound system. We used our oscilloscope to handle level-setting and our real-time audio analyzer to take care of setting the crossover point to ensure the sub blends seamlessly with the rest of the speakers in the vehicle. As always, once we are done with the testing, we complete a thorough listening evaluation to make sure that the system sounds amazing and that there are no buzzes or rattles that will take away from the listening experience. After we were happy with the system, the client returned to Ralph’s Radio to hear the system for the first time. The addition of a high-quality subwoofer with adequate power was exactly what the Range Rover needed to come to life. The client loved the way it sounded! If the sound system in your vehicle lacks emotion, impact and realism, drop by Ralph’s Radio in Victoria or visit our new flagship store at 1490 Venable St. in the heart of Strathcona. One of our product specialists would be happy to work with you to create a solution that brings your music to life and transforms your daily commute into an enjoyable experience. For more information, give us a call or send us an e-mail using our online contact page.